Asymmetrical pentaprism cover characterizes this camera from others. 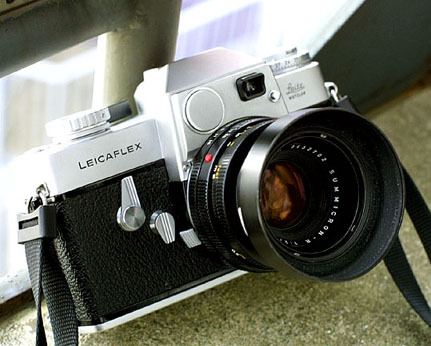 With its charming chrome-plated body, the Leicaflex has somewhat given a different appearance to us. 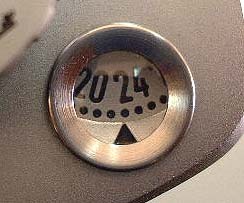 The contrast between a round-shaped battery cover and a metering widow gives an impression as if the camera winks. 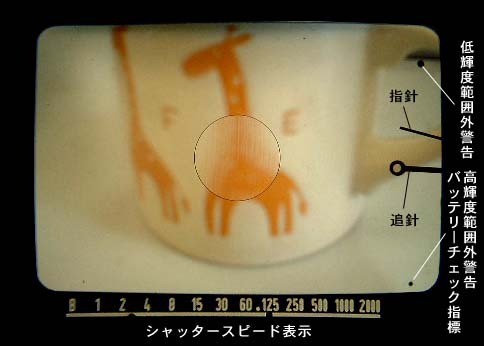 Above pictures show the quick-reference of identifying the Mark II type of Leicaflex. 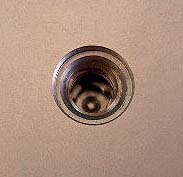 The Mark I has a fan-shaped filmcounter window and the tripod hole was fixed with 3 screws around the hole. 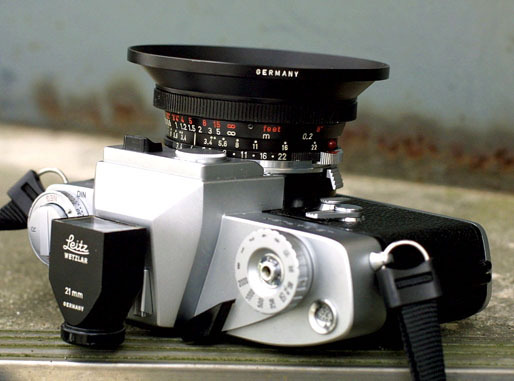 When Leitz introduced the Leicaflex in 1964, prudent people were disappointed at the specification of it which was far-below people's expectation to the Leica's first reflex camera. Despite of its 1/2000 sec. shutter mechanism and an enraptured looking, they noticed that the camera had no TTL-metering and inability to focus in the mat area of the focusing screen, since those points were really the advantages of having a SLR camera over legendary M system. Focusing area is only noted within the circle located at the center. Other area is clear-glass. It was envisaged that the Leitz tried to transplant the M's brilliant viewfinder image into the SLR. The image, even at the off-centre, we do not feel strange when compared with the latest AF SLR of which viewfinder image is even worse than Leicaflex. 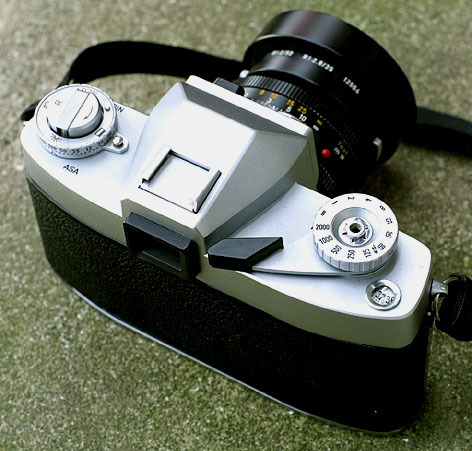 This is the only one Leica's SLR which has a capability to keep the mirror-up even after the shutter is released. 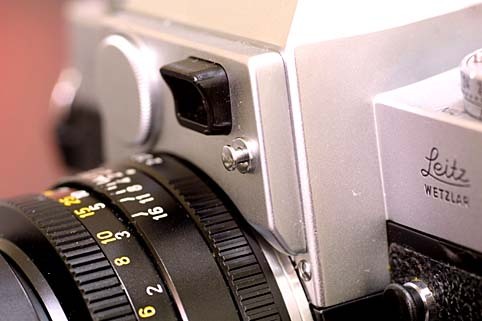 Although R6 - R8 has a mirror-up mechanism, the mirror would return after the shutter release. At the position A: mirror will be locked at upper position after the shutter release no matter the shutter is charged or not. At the position B: before the shutter charge, the mirror will be locked at upper position with the shutter charge at the same time. 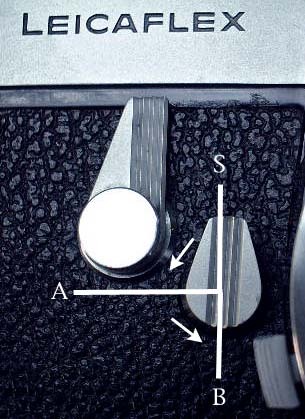 after the shutter charge, the mirror will be locked at the same when the lever is turned from position S to B. 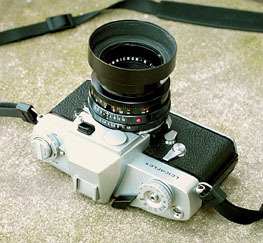 When Leicaflex was first introduced, there are the lenses with silver-chrome finish. They were Summicron 50mm and Elmarit 35mm. Later they noticed the reflected light from those silver-chrome misguide the meter system through its metering window. Leitz cease production of those lenses which became collector's item. Different finish models such as black-paint and black-chrome were produced. Feel the dynamics of Leicaflex with Super Angulon 21mm/f3.4 together with 21mm finder on top.